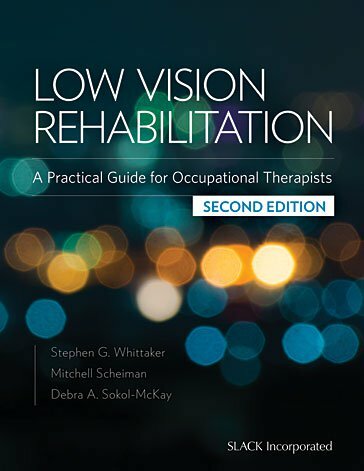 This Second Edition of Low Vision Rehabilitation: A Practical Guide for Occupational Therapists provides current, evidence-based information on low vision rehabilitation that contains several new and expanded chapters on ADLs, IADLs, and recreation, as well as new online resources and the latest in accessibility devices. Low vision rehabilitation is rapidly growing as a specialty practice for occupational therapists. This growth requires practical, evidence-based information on the evaluation and treatment of the effects of low vision on occupational performance. Responding to this need, Low Vision Rehabilitation: A Practical Guide for Occupational Therapists, Second Edition blends standards of practice that have been developed for over 50 years by low vision therapists and optometrists, with the latest scientific research and the unique perspective of occupational therapists. This text is written to introduce the student and general practitioner to low vision rehabilitation as commonly encountered in medical rehabilitation as well as provides a conceptual approach to evaluation and treatment that will enrich an advanced practice. Authors Stephen Whittaker, a low vision researcher, certified low vision therapist and occupational therapist, Mitchell Scheiman, an optometrist and researcher, and Debra Sokol-McKay, an occupational therapist with specialty certification in low vision as well as certification as a low vision therapist, vision rehabilitation therapist and diabetes educator, have carefully selected evidence-based evaluations and treatments that focus on clinical practicality and meaningful occupational goals in adults. • A chapter devoted to field loss, spatial neglect and perceptual impairments resulting from acquired-brain-injury. • The latest in Medicare documentation standards including outcome to G-code conversions and ICD-10 diagnostic coding for low vision. Low Vision Rehabilitation: A Practical Guide for Occupational Therapists, Second Edition employs an interdisciplinary perspective that is unique, practical, and credible and will benefit Occupational Therapy and Occupational Therapy Assistant students, as well as practicing clinicians interested in specializing in low vision or other health care practitioners for patients with vision impairment. Stephen G. Whittaker, PhD, FAAO, OTR/L, CLVT, is an occupational therapist, certified low vision therapist and research Fellow of the American Academy of Optometry with a PhD in experimental psychology and post-doctoral training in visual science. For over 35 years, Steve has been teaching, doing research, and providing clinical services in low vision rehabilitation. He lectures internationally. Prior to becoming an occupational therapist, Steve was a member of the faculty at the Pennsylvania College of Optometry (now Salus University) during which time he was principal investigator on National Eye Institute-, NIDRR-, and NASA-funded research on low vision and visual enhancement devices. He switched careers, earned his Master’s in Occupational Therapy from Thomas Jefferson University in 2002, and now practices as an occupational therapist at MossRehab Hospital and consults in area private practices where he provides low vision rehabilitation services. He has served on the low vision subject matter expert committee of the Academy of Certification for Vision Rehabilitation Professionals (ACVREP) and participated in the writing of the certification examinations. His broad training in occupational therapy enables Dr. Whittaker not only to treat visual impairment across the lifespan but also a variety of neurological conditions as well. From his unique background, Dr. Whittaker has built the pragmatic approach of an occupational therapist on a foundation of over 40 years of research from many disciplines. Mitchell Scheiman, OD, FCOVD, FAAO, is a nationally known optometric educator, lecturer, author, and private practitioner. He is the author of Understanding and Managing Visual Deficits: A Guide for Occupational Therapists. Dr. Scheiman has a long and close relationship with occupational therapists. He works closely with occupational therapists in his practice co-managing patients and has presented post-graduate continuing education courses to over 6000 occupational therapists. Dr. Scheiman is currently Dean of Research and Professor of Optometry at Salus University. He has written three books for optometrists covering the topics of binocular vision and vision therapy, pediatric optometry, and learning related vision problems and he has published over 165 articles in the professional literature. He is a Diplomate in Binocular Vision and Perception and a Fellow in the College of Optometrists in Vision Development. In the last 20 years he has spent the majority of his professional time as a researcher involved in randomized clinical trials. He was the national Study Chair of the Convergence Insufficiency Treatment Trial that was completed in 2008, and the recently NEI-funded follow-up Convergence Insufficiency Treatment Trial study investigating changes in reading and attention after treatment. Debra Sokol-McKay, OTR/L, SCLV, CDE, CVRT, CLVT, is a licensed Occupational Therapist in the state of Pennsylvania. She has a specialty certification in Low Vision through the American Occupational Therapy Association (AOTA) and is a Certified Low Vision Therapist, Certified Diabetes Educator, and Certified Low Vision Rehabilitation Therapist. Ms. Sokol-McKay received her Bachelor of Science in Occupational Therapy from Temple University in Philadelphia, PA, and her Master’s in Vision Rehabilitation Therapy from the Pennsylvania College of Optometry (now Salus University) in Elkins Park, PA.
Ms. Sokol-McKay has been a practicing occupational therapist for over 30 years and both a low vision therapist and a diabetes educator for over 15 years, is the second lead author of Disabilities Position Statement of the American Association of Diabetes Educator (AADE), and has presented at the AADE’s national conference many times. Ms. Sokol-McKay wrote the Occupational Therapy and Diabetes Fact Sheet for AOTA and co-presented AOTA’s podcast on diabetes. She has been a national speaker on low vision rehabilitation for Cross Country Education for the past 5 years. Ms. Sokol-McKay was a member of the AOTA’s National Expert Low Vision Practice Certification Panel, which wrote the AOTA’s standards for specialty certification in low vision. Debbie is the current chairperson of the abstract reviewer committee of the national low vision Envision conference and a reviewer for the Journal of Vision Impairment and Blindness. Ms. Sokol-McKay is also the author of peer-reviewed professional articles on low vision rehabilitation and/or diabetes self-management and has presented more than 20 times at national/international conferences of AOTA, AADE, Envision Conference, and the Association for Education and Rehabilitation of the Blind and Visually Impaired.